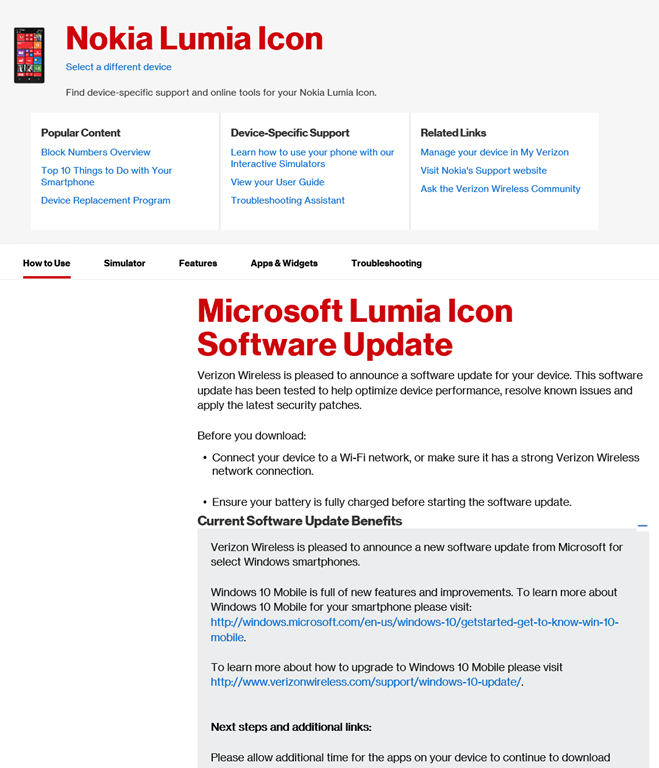 I upgraded my Verizon Wireless Lumia 929/Icon Windows Phone to Windows 10 Mobile. I’m not going to lie: It didn’t go that well, but a good part of this was my fault. If you’re going to setup a new Windows 10 Mobile device, be sure you have FEWER than 10 devices associated with the Microsoft Account you plan on using with the device. If you don’t, you may be in for a lot of hard work. One of the main reasons I wanted Windows 10 Mobile was for it’s ability to accept speech-to-text into any area that you might otherwise type via thumb keyboard. With the release of the Bank of America app on Windows 10 Mobile & the sudden availability of Windows 10 Mobile on the VZW Lumia Icon, it was pretty much a no brainer for me to do the upgrade. Run the Upgrade Advisor. It should say that the device qualified if it’s a VZW Lumia Icon. It will then enable your device to successfully “check for updates” and download the new Windows 10 Mobile OS. You should begin upgrading to Windows 10 Mobile right here by pressing the Update button. This is where I failed: You associate a Microsoft account with any Windows 10 device – including Windows 10 Mobile – in order to enable it to download & install any of the applications you’ve bought from the Windows Store. Without doing this, NONE of your Windows Store apps can run. Go to https://account.microsoft.com/devices/store which will list all the devices you have with Apps & Games installed on them from you account. This list needs to be 9 or fewer devices, because the maximum number is 10 and we need 1 spot reserved for the upgraded Icon. If needed remove a device. Keep in mind that the device you remove will no longer be able to us any of the apps installed on it from your Microsoft account. STEP 5: ALLOW THE PHONE TO CONNECT TO WIFI DURING THE UPGRADE. When upgrading, the phone will need to connect to WiFi. The reason for this is that it will add your phone to your Microsoft Account’s list of 10 or fewer managed apps & games devices (as mentioned in step 4) and begin the process of enabling your previous Windows Phone 8.1 applications to run on your newly upgraded Windows 10 Mobile Icon as a managed apps & games device. HUH? SO THE APPS DON’T AUTOMATICALLY RUN? Yes, but again, the upgrade process should fix all that. What this means is, most of your previous apps & games from Windows Phone 8.1 should come over and run on Windows 10 Mobile just fine – possibly even better if it’s updated to a new version of the app for Windows 10. For example, if there is a Windows 10 Mobile release of the same application you previously used under Windows Phone 8.1, it will update the app in-place and give you the newer release. If there isn’t, it will make sure that the WP8.1 app or game is rewired to work on W10M. If the upgrade is unable to add your device to your account, most of your applications will not work after the upgrade Windows 10 Mobile, and you will need to uninstall & reinstall each non-functioning application manually. If you’ve got the maximum number of devices (10) added to your account for apps & games, the upgrade process for Windows 10 Mobile will attempt (and fail) to add your device to your account for every application it attempts to retrofit or upgrade on your device. Note that some applications will still work, regardless of whether your device is added to your account because some apps aren’t constrained to the 10 copy limit – however most are. The quick version of my story is that I had used up all 10 devices that could be associated with my Microsoft account. As a result, 95% of my applications on my Nokia Icon failed to work after the upgrade. Test & uninstall every app that doesn’t work on the phone, then reinstall it through the App Store on the phone. The first app that I reinstalled, automatically associated this new “Windows 10 Mobile” device to my Microsoft account and the rest of the applications I reinstalled installed correctly. Note: This process took me all day as I had more than 100+ apps. This entry was posted on Friday, July 1st, 2016 at 6:23 pm and is filed under Uncategorized. You can follow any responses to this entry through the RSS 2.0 feed. You can leave a response, or trackback from your own site.